At the many family dinners, festive parties, and neighborhood open houses this holiday season, you want your table to look perfect. Many linens are special, especially when they are gifts or heirlooms handed down from generation to generation. But unfortunately, even on holidays, people have “accidents” and spill food and drinks. As a result, knowing how to care for your linens properly becomes especially important. How do you care for antique linens? 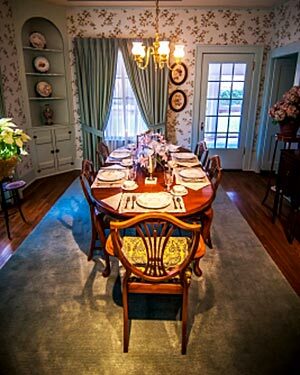 Many families use heirloom linens during the holiday season. Your dry cleaner may not be able to restore previously damaged heirlooms, but careful cleaning can help to prevent more damage. Whether you take an heirloom item in to be cleaned before or after use, let the cleaner know the age, fiber content, and even how it had been stored. This will help to determine the best possible cleaning methods. If you choose to clean an heirloom yourself, limit yourself to hand washing only. Inspect the item for damage and test for colorfastness before proceeding. Hand wash using warm water and a mild detergent, rinse thoroughly, and air dry. For some items, soak using enough water to cover adequately. Do not crowd. How do you care for lace? Lace tablecloths are also a favorite for holiday dinners and parties. Lace can be made of a variety of fibers, including cotton, linen, ramie, and polyester. Crochet, knitting, embroidery, and cutwork are the most common techniques used to create lace tablecloths. Check lace for holes and loss of tensile strength before washing. Loss of tensile strength can be determined by gently pulling the fabric in one direction and then the other. If the material feels like it will tear or pull apart, the lace may be too fragile to clean. Embroidered designs should also be checked for loose or pulled threads. If the lace tablecloth isn’t too fragile, machine wash it with a mild detergent on gentle cycle to avoid damage. Very delicate tablecloths should be soaked with no agitation. Soak in a mild detergent, follow with two rinses, and extract lightly. Many laces will need to be blocked back to their original size after washing. For this reason, it is essential that you measure the tablecloth beforehand. Using these measurements, smooth and stretch the tablecloth, and air dry. How do you keep your linens looking their holiday best? When cleaning, you should consider the item’s age/condition, stains/damaged areas, fiber content/fabric construction, trims, and how it was stored. On colored linens or linens with colored trims, test for colorfastness before cleaning. Apply a water/detergent solution to an inconspicuous area, then blot with a paper towel. If dye transfers to the towel, the item should not be washed. Colors in embroidery will need to be individually tested. Ironing your linens (especially lace) can be quite a chore. Try ironing them while they are still damp. Remember your professional dry cleaner can also clean and crisply finish your linens. Stain release finishes can help resist staining on your linens. Sometimes these finishes are applied during manufacture; they can also be applied by your dry cleaner. Remember these finishes are not permanent and will need to be reapplied each season. If a stain occurs during a party, don’t rub it. Blot gently with water. Before storage, make sure your linens are cleaned, and stains are removed. Soiling and stains attract insects. Afterward, be sure to store your linens in a cool, dry, dark area. If in doubt on how to properly care for your linens, feel free to consult the experts at Bryan’s Cleaners and Laundry.